Connecting external devices to your PC via your local network is not as difficult as it seems. Eddy Insam explains how it all works, what you need to know and describes a development device that can get you going in no time at all. You are browsing the Internet looking at you car's own web page. The screen is full of messages and indicators telling you all about your car, but an orange flag tells you there is something that requires your attention. You look at the various gauges: clutch, brake fluid, they seem OK. Oil looks a bit low though, so you place a tick under one of the oil brands in the "garage remainder" memo pad. You wonder how people did this in the past; did people actually open the bonnets and look inside their own cars? Then the door bell rings, the washing machine repairman is at your doorstep.. "Your dishwasher just e-mailed us to say its drive belt is just about to go." Whether you think the concept of networking your possessions is a good thing or not, it may be of some use knowing how it all works. In any case, this article is for you because it will at least put you on the first step of the "I am not afraid of the technology" ladder. On the other hand, you may be thinking of network-enabling your own product or application, and may have been put off by the apparent complexities involved. This article will give you an insight into the expertise and effort involved. What's more, the preprogrammed chip available from the author (described in next month's article) will give you a head start on the prototyping stage. As a consultant, I am sometimes asked about the Internet and its potential extended uses. Boring as the subject may be, the conversation sometimes ends in opinionated discussions about the need for Internet fridges and microwaves that e-mail you when the noodles are ready. Nevertheless, there are some interesting possibilities for considering the use of a local area network as a serious interface between a PC and external I/O devices. For one, it means the two can be as remote from each other as need be (anywhere in the world in theory). You can also share a device among several users, say a rooftop webcam or weather monitoring station accessed by all users in a building or school (or even from home). There are benefits at the practical level too. Remote data logging and controlling equipment becomes much easier when it can all be done using standard and well-tested networking components, cabling and connectors. New network models such as RTPS (Real Time Publish Subscribe) are also making Ethernet more suitable for real time systems, data logging and control. Interesting possibilities arise too when interfacing to other proprietary networks such as Home Automation, X10, CEBus or LON. But then, it can all sound very complicated: the protocols, the stacks, and so little information published - but is it? The answer is not really, and certainly not out of reach. Internet-enabled hardware products are slowly becoming commonplace. From vending machines dialling up to report their stock, to pinball machines publishing their high scores on the Internet for all to see. Internet appliances (the term used for browsers that do not use a computer) are predicted to overtake PCs for Internet use within the next four years. A new addressing scheme for the Internet (version 6) allows for a staggering 2^96 times the number of addresses currently available (the address field is 128 bits). Each nut and bolt in your washing machine will be able to have its own unique Internet address. Many modern products are driven by internal microprocessors. These small devices are quite powerful, but one generally omitted fact is that in order to implement the functionality required for internet and network access, a lot of program code space is required. Gone are the days of simple ASCII dial-up interfaces, simple ZMODEM or Kermit protocols. Nowadays your processor has to deal with PPP, ARP,IP, ICMP, TCP and a host of others. More on this later. PCs are well known for their lack of suitable interfaces into the real world. PCs were not originally designed with many facilities for driving external equipment or to act as data gathering stations. Many alternatives using the parallel and serial port have been on offer, but this approach is becoming less practical nowadays, especially with NT and Windows 2000 where special low level software system drivers are required. Worse still, parallel and serial ports are now called ‘legacy’ devices, which is computer jargon for obsolete. The newest machines from the shops just do not have these ports any more. These are all being replaced by USB. USB devices may eventually be accepted as the standard method for general purpose direct, local interfacing to a PC. The advantage of using a network, as opposed to a direct connection is distance. Most PCs will have a local network connection. Low cost Ethernet cards are readily available and easy to install, even in older and non-PC machines. From this point of view the use of Ethernet for I./O external access is an attractive, cheap alternative. Furthermore, different brand, newer and older machines with different operating systems can access the devices. Macs, Linux, Unix and portable handheld devices can all be used. Fig 1. If you develop a piece of network hardware, you will need to think about how to drive it from the PC. You may not need to write any software at the PC end at all. Your device could for example emulate a web page, and be accessed as if it were a normal Internet page. If you need more dedicated control, standard API libraries are available for network communications. The one in Windows is called Winsock, a family of API calls contained in a DLL file. There is also higher level support in the form of ready made OCX components, add-ons for Visual Basic and C. The listing at the end of the article shows a simple 'C' demonstration program showing how Winsock calls can be used to send and receive data from a remote on the network. Fig 3 shows a block diagram of the business end of a simple Ethernet embedded device. It consists of a small dedicated microprocessor connected to a custom Ethernet interface chip, which is in turn connected to the local area network via suitable electrical isolation transformers. The Ethernet interface chip acts like a sophisticated serial-to-parallel converter. Its job is to read serial packets of data from the wire, check their header bytes with an internal address, perform checksum calculations, and push the block into a user accessible First In First Out data buffer. The FIFO queues the data blocks for processing by the application. The job of the microprocessor is to retrieve the blocks, and according to the information within, perform a few more data calculations and checksums, then pass the 'clean' data on to another device or system. The micro must be quick enough to retrieve frames from the FIFO buffer before it overruns, otherwise packets may be lost. During transmission, the opposite takes effect. The microprocessor places data blocks in a buffer, the Ethernet chip then adds any required headers and checksums, perform the parallel-to-serial conversion and then push the serial stream into the wire, while at the same time checking for possible collisions. More or less, that is all there is to it. The rest is all done in the software. 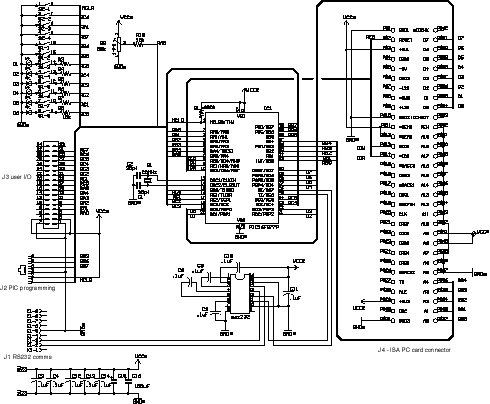 The microprocessors job looks simple. Take data from a buffer, do some conversions and then do whatever with it. Easy?, Well, not quite. A fair bit of housekeeping needs to be done along the way. We need to include functionality to communicate packets in the background with other users to let them know who and where we are for example. There are various established ‘protocols’ that describe exactly when and how this should be done. Protocols, as camels designed by committees, are by definition complex. The following values give a rough idea of the amount of program code required to implement an average Ethernet enabled application (values are for a PIC 16F877 using assembler): ARP, 1.5Kb, IP and ICMP, another 1.5K, TCP another 2.5K. PPP (for modem access) 3.5Kb. So if you want to Ethernet enable your project, you may need to dedicate quite a bit of program space to handling the protocols. But do we need to use these complex established protocols? Can't we just talk directly to other workstations using our own simple private encoding system and keep life simple? The answer is yes, each Ethernet packet carries a frame identifier that describes the protocol format used by its payload. Pick a number of your choosing and send any data format you like. Your privately encoded packets will just be ignored by the rest of the network (but first check with www.isi.edu/in-notes/iana/assignments/ethernet-numbers/ to ensure the number you have chosen has not been already allocated!). Of course, you will need to program your PC to talk directly to the Ethernet card, and your packets will not be able to get past a router onto another network or the Internet. There may be real advantages in using alternative network models, for example to maintain speed and response times. There isn't that much software available at present out there, expect little support from software vendors. For real flexibility, you will need to go IP, and until dedicated TCP/IP interfaces are built in to the micros in hardware, you will need to live with the complexities of handling the protocol in software. There are already a number of products in the market offering different levels of functionality. The best way to find out about these is to look at the websites mentioned at the end of the article. What follows is just a simple summary. The most common offerings come in the form of complete PCB cards with built micro, RAM, PROM and usually a built in Ethernet interface driver chip. Units range in size from the smaller 8051 core-based, to larger, 386 embedded Linux-based cards. Network functionality is usually supplied in the form of a ‘C’ software library or module that the user compiles or links with their existing code. This is sometimes a cut down, but workable, version of the standard sockets library. If you do not want to use a ready-made card, there is nothing much available at the single chip level. A notable exception are the iChip systems from ConnectOne and Seiko. Originally offered as a set of software/firmware licences implemented in ASIC form, this is now available in single chip form (the Seiko part number is 7600). A US company, Ipsil, have just announced another single chip device. More devices are expected to appear in the future. In general I have found with some of these products is that their advertised claims belong in the "flexible with the truth" class. This is reflected in the unnecessary long times taken to get the software to work properly and reliably. This is possibly due to the newness of the technology, but it is a hard way for you to learn. Roll your own or boil in the bag? If you want to network enable your application, and depending on how complex it is, you will need to decide whether to go for the ready-made route, i.e. buy cards, modules or components in, or roll your own. If you are starting from scratch, the initial learning curve is pretty steep, and using a ready-made solution may be your only option. It is pointless to re-invent the wheel. If you are considering quantities or reliability, a deeper knowledge of the product and its performance may be important. In practice this means that you could spend as much time trying to get an external offering to work properly and reliably (especially one that doesn't perform as well as advertised) than developing your own from scratch. Again, depending on your requirements, you will need to evaluate the functionality to be included in your application. It is pointless to include the full TCP stack into a product that would be happy to communicate using simple UDP packets. This is a waste of code space, components and resources. Is speed of access important? Is your field of work in Real Time Systems? If so, you should consider alternative network models. As mentioned at the beginning, the ready made controller described in next month's article may help you a little bit with this decision process. It will allow you to evaluate and try possibilities and use it in prototypes. Because its provides access to the data stream at various levels, it can also be used as a teaching tool, and as a component into a more advanced network tester or server (The device was originally designed as a tool for network stressing). The approach I have used with the controller is to use two processors. One is used purely to handle the protocol interactions, and another, supplied and written by the user, to handle the actual application. Data transfer between the two is via simple serial commands. The boring overheads such as checksums and framing are completely handled by the main controller. If you have managed to get this far, and still you think you have not understood networks, don't despair. The next few sections will unravel some of the theory, and explain what you need to know. No article on Internet basics can do without a guided tour of the technology, from the bit-shifting protocols to the higher level scripts. I am not going to cover this in any detail, as there is plenty of information around in books and magazines. What I have done is a quick tour of the basic concepts involved, with special relevance to a microcontroller-based implementation. The references mentioned at the end of this article contain all the extra detail you may ever need. The main source for detailed specifications are RFCs (Request for Comments). The text contains the reference number that relate to the topic. RFCs can be found on the internet by searching under "RFC". On the back of your computer there may be a network connector. Look for a BNC socket with a coaxial cable (remember RG-58U? ), or a flat cable ending in something looking like a plastic telephone connector. In most offices, these wires just disappear down the back of the desk only to reappear at some obscure room at the end of the corridor. Most office workers will know this place. They will tell you this is where the computer technician hides when nobody can find him in the building. Ethernet is one of the main survivors among a number of similar technologies developed in the 1970s and 80s, possibly because of its ‘low tech’ simple and reliable approach. The coaxial cable ‘thin wire’ version (also known as 10Base2) is widely used in low end applications. 10Base2 is simplicity in itself; all workstations are connected together in daisy-chain fashion with a 50-ohm terminator at each far end. Data packets are just bursts of current fed into the impedance of the wire, and are read as voltages by the receivers. Transmitters fire bursts more or less without the knowledge of any other transmitters. Collisions (i.e. when two generators feed the wire at the same time) are detected by an abnormal rise in the voltage on the wire as two or more currents superimpose. Each transmitter then waits for a certain random time before attempting to transmit again. The flat or twisted cable variation (known as 10BaseT) uses separate wires for transmit and receive; this gives better error immunity and simpler driver circuitry at each end. However, workstations cannot just be connected to each other, they need to be connected to a central ‘hub’, which acts more or less like a repeater or distributor. Other methods are available, working on similar electrical principles. In terms of speed, two main flavours are available, 10MHz and 100MHz. 10MHz is the most popular in many small office and home environments as it is easy to install, and the cables are easily cut and crimped. We shall only be using the 10MHz version here. A speed of 10MHz sounds appealing when considering using a LAN for interfacing to external I/O devices. Reality is different; one must consider the inefficiencies of any start-stop burst protocol, plus gridlock effect caused by collisions and other users sharing the network. There is much good and bad statistics around showing relationships between usage and throughput. Just as on today's motorways, you can experience holdups at the most obscure times and for no apparent reason. Anybody designing equipment using a network for data transfer must be well aware of this. As a conservative estimate, just one PC and one interface (no other users) should be able to exchange data at between 70% to 90% of the full advertised speed. Throughput decays drastically when more users are on the network at the same time. The sensormag article in the reference includes some charts and calculations plus a pointer to an excel program to estimate these delays. In terms of hardware support, there are dedicated Ethernet interface chips available from various manufacturers. Most are compatible with a standard generic architecture (NE2000) and implement a standard 8 or 16-bit data bus interface, compatible with most CPU addressing schemes. Access to the chip is done via a number of internally paged registers, usually arranged as sixteen I./O or memory locations. Most chips can be directly connected to a CPU memory bus, or even directly to a PC bus edge connector. The blocks of data being transferred are stored in FIFO memory, as a buffer area for the different speeds between the LAN and the rest of the system. Using the chip involves first initialising a number of registers to set the various operating modes, e.g. 8 or 16-bit transfers. Then using a loop (or an interrupt routine) to wait for a ready data register flag denoting that so many bytes of received data are present on the FIFO buffer. On transmission the system places its data in another part of the RAM buffer, and sets a flag, which is usually reset at the end of transmission. More detailed information on the workings of Ethernet interface chips can be found in manufacturer data sheets. Unfortunately, there doesn't seem to be much information available on the Internet apart from some National Semiconductor data sheets (see reference). Every Ethernet packet or frame has a header consisting of a 6-byte source address, a 6-byte destination address, and a 2-byte protocol identifier. This is then followed by the payload, which as mentioned before, can only have between 46 and 1,500 bytes. On reception of a frame without errors, this payload is ‘peeled off’ and passed on to the rest of the system. The protocol identifier field specifies which type of protocol is being carried by the payload. For example, 0x806 denotes an IP message. It is important to know that Ethernet data bursts or frames are completely independent of each other. Frames are fired like bullets out of a gun, and, apart from a collision detection mechanism during transmission, what happens to them afterwards is of no further concern to the transmitter. In other words, the Ethernet network layer does not provide for any global form of flow control or error protection. At the other end, received frames are checked for consistency by calculating their CRC. Frames arriving with errors are simply dropped or ignored. It is up to the higher layers to provide for any form of flow control and error protection. It is also relevant to note that the source and destination addresses are ‘hardware’ addresses. Known as Media Access Control (MAC) numbers, they refer to 6-byte patterns uniquely associated with each Ethernet card and usually assigned at manufacture. In practice the address is stored in a separate serial EEPROM memory chip on the actual PC card. Blocks of addresses are assigned by the IEEE to each manufacturer, so when you buy your PC card, it will have its own unique number stored in it. You can always change this number if you wanted to, and apart from some simple restrictions (the first byte in the sequence must have a ‘1’ and a ‘0’ as its lower significant bits), any number can be used as long as there are no clashes with other cards in your network. It is not practical to rely on fixed hardware addresses when managing a real computer network. Therefore, a more flexible form of addressing is used. This addressing scheme consist of four byte sequences (known as ‘IP’ addresses). They are displayed for human consumption as four decimal numbers, e.g. ‘192.168.0.1’. In a computer network, each workstation is allocated its own IP address, maybe once only by the network manager, or dynamically at various times by a program in the network server. Each workstation with an Ethernet card will also have its own hardware MAC address. The four byte IP address means nothing to the Ethernet card. Ethernet frames contain only MAC addresses as destinations. Sending a packet of data to a remote location requires knowing its MAC address. If we connect a black box into a network containing our controller and data logger, we must allocate it an IP address, and notify everybody else of it. But how does the rest of the network know what our hardware MAC address is, and how to access us? This is why we need to know about ARP. For more on Ethernet and IP, see RFC894. As mentioned before, the payload in an Ethernet frame can carry formats other than IP. One such format is ARP, ARP is a simple query-response packet protocol used to match workstations hardware addresses and IP addresses. ARP stands for Address Resolution Protocol. In a typical network, computers spend a small part of their time sniffing each other, that is, sending short probe packets too see who else is around. This is usually done on a regular, or on a ‘need to know’ basis. The ARP protocol is used for just that. It makes use of a special MAC ‘broadcast’ destination address (0xFFFFFF). Broadcast messages are accepted by all Ethernet stations on the network. The broadcast message basically says, "Hey out there, anybody with IP address 190.168.0.15?" The one and only station having this IP address allocated will then reply with a packet stating its hardware MAC address. In Windows, each computer builds up and maintains a local table of IP vs MAC address pairs. Before sending a message to another station, the table is consulted and if there is no entry, an ARP query message is sent out. The table is dynamically maintained, flushed and refreshed every few minutes. To see this in action, open a MS-DOS box in your computer. Now enter "C:>arp -a". This will display the current IP/MAC address pairs for all the local machines in your network. You may see nothing, especially if there was no recent network activity (remember the tables are dynamic and flushed every few minutes). Next, enter "C:>ping 192.168.0.15", (or the address of any other station in your network), and wait to see any replies, then try "C:>arp -a" again. Assuming our prototype controller is connected to the network, the screen will show "192.168.0.15 4E-54-54-50-49-43" We exist!!! Any embedded Ethernet controller must include some form of ARP reply processing in order to respond to ‘who are you?’-type requests made by other stations on the network. The controller also needs to include methods for querying other workstations in the network for their MAC addresses (ARP requests). This is one of a number of necessary overheads that push up the amount of code required in the controller, but are essential for the proper operation in a shared network. IP forms the backbone of all TCP and UDP messaging. IP stands for Internet Protocol. Like the rest, each IP packet (better known as datagrams) has itself a header and a payload component. RFC 791 is the basic document describing IP. The most important items of information carried within the IP header are the source and destination IP addresses. For local communications between two stations in a local loop, the IP address in the IP header and the MAC address in the Ethernet frame header just preceding it will correspond to the same workstation computer. This may sound like unnecessary repetition, but this pairing is required for routers, where the fields will be different. There are other various fields including a checksum, a fragmentation pointer, a protocol code for the payload, and the payload itself. Like Ethernet frames, IP datagrams are independent of each other and contain no in built error protection or recovery. So why is IP necessary? IP is the common layer above all hardware dependent transport mechanisms. Irrespectively on how the devices are electrically connected together, fibre, radio, phone lines, all data blocks end up as compatible IP datagrams. The job of IP is to get the data block to its destination. Its main contributions are addressing, routing and fragmentation Remember how Ethernet frames had a limited byte size range? Similar limitations also apply to other transport mechanisms: optical fibre, satellite links etc. IP allows datagrams to be chopped (fragmented) into shorter sections of the right size for transmission and vice versa: short sections packed into single, longer datagrams. The method employed for fragmentation is relevant for embedded systems. Fragmented datagrams include a ‘pointer’ indexing the position of the first byte of their data payload in an imaginary 64kb data buffer. Therefore, each IP datagram contains exact information about the position and size of their payload within this imaginary buffer. 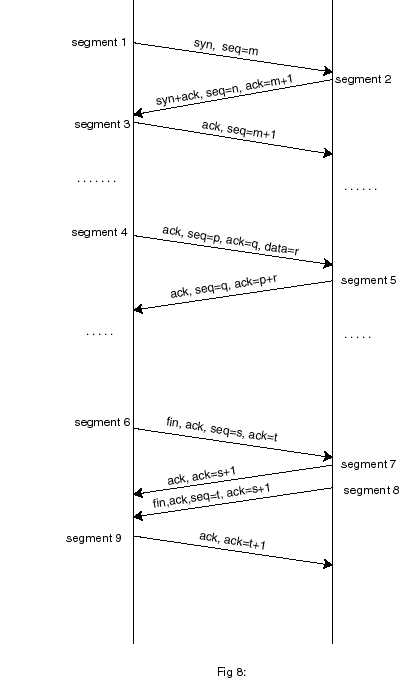 This allows for fragmented datagrams to be received out of sequence. A receiver accumulates datagrams until they all neatly fit into a contiguous block. It follows that fragmented IP datagrams are not completely independent of each other. This will introduce a time element in any system. A receiver for example, has to consider when to give up waiting for missing out of order packets, and dump any previously stored. Fragmented datagrams cause problems with small embedded systems. In theory, a receiver needs to allocate a 64kb buffer for every first out of sequence datagram received. This means one buffer for every different open socket (or channel) being serviced. This is impractical for small RAM limited systems. One practical solution is to disallow or ignore fragmented IP datagrams. This may not be much of a problem if the transactions involved are small, eg for a a small data logger. However, there may be problems for systems dealing with long streams of block-encoded data such as voice or video. Fragmentation is not much of a problem with TCP (see later on) as TCP can be engineered to use small segments to start with. In a typical situation, an embedded system may need to deal with many sources or originators. Datagrams may be arriving from more than one source at the same time. The microcontroller will need to keep track of all, keeping state variables for each contact, to ensure the right replies are sent back to the right originators. In a PC this is easily handled using concurrent threads. Small microcontrollers do not have such niceties. Three types of IP payloads are of interest to us: ICMP, UDP and TCP. ICMP stands for Internet Control Message Protocol. This is not a protocol used to transfer messages but rather to provide a kind of internal maintenance messaging service. One of the most common uses for ICMP is a service known as PING. This is a method where a workstation can query another by transmitting a special short ‘ping’ message and wait for an echo response (think of submarine echo sounders). More on this later. Suffice to say that any embedded implementation should incorporate facilities for echoing any PING commands received. ICMP replies are also commonly sent in response to failed UDP datagrams. An embedded application should also incorporate simple facilities for responding with ICMP ‘unobtainable’ messages. ICMP is documented in RFC 792, 950, 1812, 1122, 1191 and 1256. UDP stands for User Datagram Protocol. UDP is a simple Transport Layer Protocol, it is a connectionless, unreliable protocol with no error or flow control mechanisms. In effect, UDP is nothing more sophisticated than an IP datagram with an extra addressing field: a port number. A port number is an interesting concept. If a workstation has an IP number allocated to it, how can different processes or programs in the workstation communicate at the same time? The answer is using ports. Workstation "192.168.0.31" can use port 21 to Telnet to another workstation, use port 80 for web access and use port 27 for file transfers. Think of telephone extensions working off a main private exchange number. UDP is fully described in RFC 768. Sending a UDP message is somewhat like sending a postcard to a friend, a simple ‘shoot and forget’-type protocol. It can be very reliable in networks that are reliable to start with such as LANs and is normally used for simple file transfers, remote booting of PCs or anywhere where a failure to receive is not a disastrous issue, or one that can be simply compensated by a repeat transmission later on. Because of this simplicity, UDP is a simple protocol to implement in an embedded application. Simple error recovery can be implemented at the user level, this can take the form of mindless repetition to a simple ‘ACK’-based datagram response. Writing the software at the PC end is also easy, as the program in Fig 2 shows. 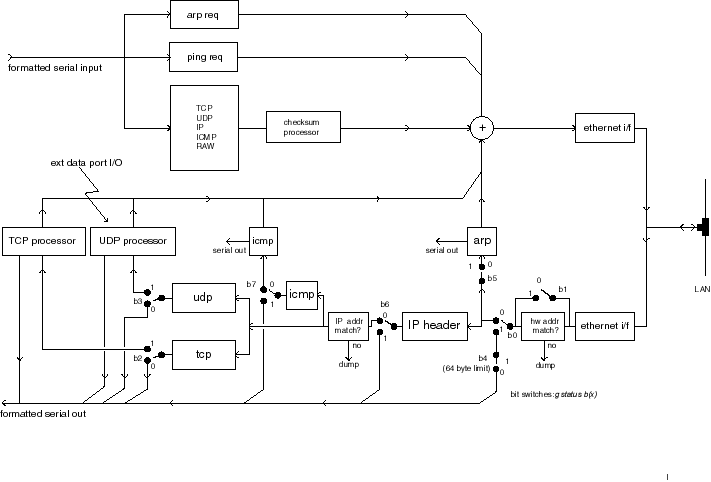 Our controller uses UDP to demonstrate simple read and write to a parallel and the analogue port, also for simple data connection to and from the user serial port. UDP is an effective protocol for developing special user applications. TCP stands for Transmission Control Protocol. TCP is a totally different kind of fish to UDP or to any of the protocols described previously. TCP is a connection (point to point) oriented, reliable, byte stream service. TCP is where all error protection and flow control is carried out. The main document for TCP is RFC 793. With additional information in RFC 896, 1122, 1323 and 2018. Traditionally, error and flow control in telecommunications was handled at the lower layers. It was recently discovered that low layer error handling is not as effective as higher layer handling. This is one of the reasons why the layers below TCP do no need to provide any form of error or flow management. TCP requires all data to be acknowledged. Rather than acknowledging each segment individually, TCP uses a pointer scheme where the receiver acknowledges the position of the index or pointer of the last reliable block of data received. Each segment thus carries a block of data plus an index pointer into an imaginary array of bytes, that is, where the data block belongs in the array. This scheme is very convenient as it allows segments to arrive out of order. There is no need to acknowledge every segment received, a single ack can be sent for more than one transmission segment received. Both transmitter and receiver also operate a ‘data window’ scheme telling a transmitter how many more bytes the receiver is willing to accept, this provides a form of data flow control. By constant adjustment of the windows and delays, TCP can be tuned to provide an efficient flow mechanism tuned to a particular channel's characteristics. In such a channel, the transmission line is nearly constantly active all the time, with very few ACKs sent back. You could see efficient and inefficient TCP in action by observing the TX and RX lights on a modem. Inefficient TCP is when both TX and RX flash or flicker in opposition, with periods of no activity in between. Efficient TCP is when the RX light is nearly constantly on (denoting a nearly constant flow) with the occasional flicker of the TX ‘ACK’ light. The standard software method uses a state transition table, linking ‘actions’ with ‘states’ and ‘events’, plus a data control block to store all variables for each particular connection (a.k.a. socket). In normal practice a server (or listener) opens a new thread for every open connection request received from a client, this thread is maintained until the connection is closed. The state table is described in detail in RFC 793. Implementing the full set of TCP requirements in an embedded system is not trivial. Including each and every combination of events, states and actions will readily inflate the program and data memory space already at short space in a micro. In addition, threads are not easily implemented in the smaller devices. Fortunately, some simplifications can be made by taking a number of assumptions, for example, long-term connection coherence and resilience to repeated and/or missing data. Depending on the use it is put to, it is perfectly possible to implement a perfectly workable ‘lite’ version of TCP in an embedded processor. These are higher level Application Protocols. They were designed for specific end-to-end purposes (e.g. FTP for file transfer, SMTP for mail, HTTP for web access) and have one thing in common. They work by sending and receiving streams of bytes (usually ASCII characters) down an already opened TCP connection. In terms of implementation, these are relatively simple. One just needs to generate the right sequence of characters (maybe even using a BASIC-like program), as long as there is an existing TCP open channel into which one could pipe the characters. Implementing a simple web server is nothing more than a program that receives an ASCII serial stream, senses for special character sequences, and sends back another sequence of characters. A number of alternative network models exists, most are designed for particular applications such as stream voice, video, and real time control. RTPS stands for Real Time Publish Subscribe, and is a good example of a recent innovation in networking models. Nodes "publish" data onto a network or "subscribe" to any data they need from the network. Subscriptions eliminate the need for request traffic. The model is aimed at Real Time Control Systems using the Ethernet, where speed of response and reaction has to be tightly controlled. A number of companies such as General Motors have evaluated the use of Ethernet in such schemes, and have found it a very reliable real time transport medium. RTPS technology is very recent, and typical of a number of similar developments to move away from the limitations of TCP. Companies such as RTI (www.rti.com) are offering components and toolkits under a $10k licence. For some small Real Time applications, a subset of the technology is all that may be necessary. I have been looking at some implementation possibilities, and can see that this is an area that will see a lot more development in the future. I have limited the description to operation over a local area Ethernet-based Network. This may or may not be connected to the rest of the Internet via a router or server. Most of us will use a dial-up Internet Service Provider. The link between us and the ISP is via a modem, and the protocol generally used on this link is called PPP (or the older variant SLIP). The main purpose of PPP is to encapsulate IP datagrams into a form more suitable for modem communications; this is done by using special escape sequences to avoid transmitting characters such as ETX which can produce odd effects on some modem links. Extra PPP messaging sequences are used at the beginning of the transaction to negotiate details on the transmission methods used, types of compression, to exchange passwords and to allocate a dynamic IP address. PPP is not implemented in the present version of the controller. Even a simple version of PPP would take at least 2k of program space. Implementing PPP is not trivial. ‘Lite’ versions of the protocol may not be very reliable, and can be very ISP dependent. PPP is a negotiated protocol; a negotiation can sporadically fail, say by a client requesting facilities that a server may refuse to provide at that time. The idea of intelligent buildings and home automation has been with us for a long time now. Many proprietary standards and protocols for interfacing and control now exist; many are still under development. These systems have found a slow uptake and difficult marketing, perhaps because of the high cost of the interfaces and sensors. The introduction of low cost IP technology may influence future decisions on this subject. Fig 9 shows a way a PC LAN could be linked to an X10 Home Automation network. There are not many common or emerging protocols for such interfaces at present. In the next part of this article, I shall be discussing ways of implementing a simple controller based on a PIC 16F877 microprocessor and a standard LAN PC card. This controller can be used for demonstrations and as the basis for an embedded prototype interface project. Dr Eddy Insam is a consultant in innovative applications of telecommunications and specialises in graphics and signal processing. He can be reached on edinsam@eix.co.uk. If you are considering a serous application for this device, the author will endeavour to answer your queries via e-mail. National Semiconductors Ethernet Chip data sheet www.national.com/ds/DP/dp83905.pdf. RFC papers are available from various websites in different formats. Try one of the search engines such as www.google.com and enter the search word "RFC". W.Richard Stevens. TCP/IP Illustrated, Volume 1 . Addison Wesley, 2000. A very comprehensive guide for all aspects of TCP/IP. This is one of the best known books in the subject. T Lee and J. Davies. Windows 2000 TCP/IP Protocols and Services, Technical Reference. Microsoft Press, 2000. This book contains a CD with all published RFCs to date. A. Jones and J Ohlund. Network Programming for Windows. Microsoft Press, 1999. A must for anybody involved in network and Winsock programming. Many examples are included. A description of the Dallas Java-based web controller. Following from last months article in which Eddy covered the theoretical side of accessing I/O devices using the Ethernet, he now discusses the practicalities of putting your own design together. In last month's article, I covered some of the theory behind designing embedded microprocessors and local networks. In this second part I shall describe a practical implementation using a preprogrammed PIC 16F877 device, which together with a cheap, standard LAN PC card can be used for demonstrations and as the basis for a prototype interface project. Do not expect too much punch from this device. After all, it is only a PIC with 386 bytes of RAM. Having said that, It can be quite an effective tool for test and development. It is amazing what you can do with it if you have a little bit of imagination. Why would you want to build your own? After all, you can get ready made $99 stamp sized devices to do a similar job. For one, if you want to know about low level protocols, you have a special application or your product demands a competitive edge, then you will need to be involved at a more detailed level. The raw access provided by our device can be very useful for experimenting with or developing special applications. The black box approach is a quick and easy way to get results but after all, a black box is a black box. When something doesn’t work as you expect, the only thing you can do is look at the wall. Single sourcing and product volatility are also just round the corner waiting to hit you hard. Not long ago, I ordered a TCP development board from the States. By the time it arrived, the company that made it decided to pull out of the TCP side of the business. I am glad this device was not going to be incorporated into a manufactured product! Having said all that, some of the ready made kits can be very cute. One that caught my eye recently is the SitePlayer from NewMedia Inc. Maybe because it uses a layout very similar to the project in this article or maybe because it all fits into a single 1” by 1” printed circuit board, I shall never know, but I liked it! Fig 1 shows the main interface circuit diagram. To avoid using difficult-to-obtain parts such as Ethernet line transformers, I used a ready made cheap ISA PC LAN card; these are readily available for less than £10 currently. The 16F877 uses quite a few of its available I/O ports to drive the PC card: port D is used for bi-directional 8 bit data transfers, five bits of port B are used to address the sixteen I/O mapped registers, and the three available bits of port E are used to drive the read/write strobes. The remaining ports are available for user interfacing, including serial communications, reading the DIL switch, and for general purpose digital and analogue I/O. As mentioned, only five address lines are used with the PC card. The Ethernet chip communicates via 32 I/O mapped registers, so five bits is all we need. The other address lines are just hardwired to map to the nominal address range 0x300 to 0x30F, the usual default for this type of card. You will notice that ISA PC cards have two edge connectors, and that I am using only one here. This is because these cards were designed as plug compatible 16 bit enhancements from the original PC XT bus, which only work in 8 bit mode. The second edge connector carries the remaining 8 data bits plus a few more control lines. The electrical design of the card works in such a way that leaving the second connector floating or unconnected will automatically configure the card for XT compatible 8 bit transfers. The only other IC device in the diagram is an RS232 converter. This is only required if the PIC is to communicate with another controller, PC or microprocessor via its serial interface. Of course, this is only relevant if you want to develop your own application and drive the PIC via the serial port. You may decide to dispense with the converter chip and provide the output at TTL levels, after all, there is no much point in converting your data to RS232 levels only to be converted back to TTL levels at the other end. The serial interface operates at either 57600 bps or 2400 bps, depending on DIL settings. I added a DIL switch to read startup conditions during reset such as port serial speed. The PIC also operates a "cleanup" reset to force the contents of the internal EEPROM to absolute default conditions, this is done by forcing port C6 down while resetting the chip, hence the two DIL positions connected to these pins. Other DIL positions are connected in series with the LEDs to allow the same ports to be used as inputs and avoid being loaded by the resistance of the lights. The demonstration software mentioned later uses these ports to flash the LEDs. No project is worth anything unless it can flash some lights so this is a good reason for including them here. Of course, you can use these ports for anything you like, input or output. The various spare I/O port data lines brought out to a connector J3. The assumption here is that there would be another PC board containing the "user" section and other custom interfaces. The 16F877 has an built-in 10 bit A/D converter, and can read analogue data from any of the 5 lines in port A. This can be quite useful in our project for reading sensors and other devices. The analogue outputs must be conditioned to supply an output voltage range between 0 and 5 volts, as this is the range of the A/D inputs. 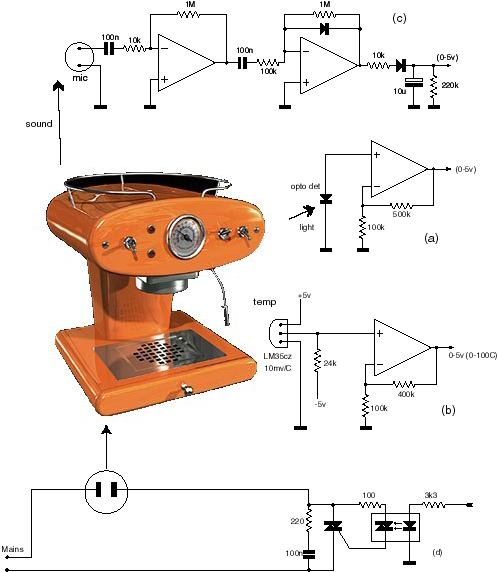 Fig 2. shows some simple examples of sensors that may be used In a hypothetical Ethernet controlled coffee maker. In fig 2a A standard opto detector diode is connected in voltage mode, making it respond to the logarithm of light intensity. The two resistors provide a gain of 6-8 to bring the output to within the 0-5 volt range. Similarly, in fig 2b, a temperature sensor, using a LM35CZ device with a sensitivity of 10mv/degree output, is used with an op-amp with a gain of 5 to bring up the voltage output to cover a 0-100 degree centigrade span within the required 0-5 volt range. The LM35 is a pretty accurate device, so 1% resistors should be used if you want to read temperatures to the nearest tenth of a degree or so. In fig 2c, the ambient noise level sensor uses a simple ceramic microphone with a simple peak level detector to give an output roughly proportional to overall ambient noise levels. Gain and time constants can be adjusted to suit your requirements. Fig 2d shows how one of the outputs can be used to switch the kettle on and off via a opto isolated triac circuit. Readers who are more "digitally" inclined could use devices such as the Dallas one-wire bus temperature probes. These sensors do not rely on external analogue components for accuracy, and deliver their outputs as serial bit encoded data. The outputs from these can be fed to a separate small PIC, e.g. a 16F84, suitably programmed to generate a serial stream at either 57600 or 2400 bps, which is then feed to the 16F877 via its serial port. You must now get a network card. Ensure the card is an ISA card, not PCI, and uses the REALTEK 8019AS chipset. The "AS" version of the 8019 chip includes an internal 16Kb buffer (the ‘plain’ version does not). Many NE2000 generic cards are compatible with the 8019AS, but not all. There may be a problem if you want to use an existing or obsolete card from your old computer, The PnP (Plug-and-Play) system in your PC may have initialised it to a different base address value from the default of 0x0300. If this is the case, the micro controller may not be able to access the registers. Try reconfiguring the card by placing it back in your PC. Using the Windows Control Panel (in Windows 95 or 98), and reconfigure the base address to 0x300, there is no need to change the interrupt settings as they are not used. It may be also possible to disable PnP on the chip by hardwiring one of the pins on the 8019AS chip to VCC, refer to the chip's data sheet to find out the exact pin number which will depend on the device package used. You will need a very small soldering iron. After all the PCB has been wired up and connected together, it is time for some tests. Plug the PC Ethernet card into the socket and power the board with 5V. The LED should start flashing at about once per second, indicating the PIC is working and addressing the Ethernet card. Connect the unit to your PC LAN via the BNC or twisted cable. Ensure DIL switches B5-B7 are in the "off" position. This will default the chip to 57600 bps, and also enable the "demo" mode. There is no need to use the serial port at this stage, but it could be very useful for performing initial tests and for generally seeing what's going on. Connect the PIC serial port interface to a spare comms port in your computer. You can use any terminal emulator software if you have one in your PC. Alternatively, use the supplied program "877driver.exe". This program has facilities for transmitting pre-programmed ASCII sequences making any setting up easier. The program communicates at 57600bps, so do ensure that bit 5 of the DIL b5 is "off", i.e. PORTB-5 or pin 38 of the PIC is not connected to ground. Fig 3. With "877driver.exe" running, resetting the Controller, which will cause the string "<Pp>" to be sent to the PC, and be shown on the screen. This is an indication that the card is working, the character pair "Pp" is specific to Realtek 8019 chips. You may get a different character pair if your card uses other chipsets. If the string is not displayed at all, the Ethernet card is not being addressed by the PIC properly, refer to the previous note on PnP addressing. Once you get a response, try querying the controller for its IP address. You do this by entering the single letter Q in the transmit Edit control, or alternatively by clicking the "Query variables" tick box, followed by a click on the "xmit" button to send the command to the PIC. The PIC will return a string of bytes corresponding to the current MAC and IP allocations for the card. To display these properly, you must ensure the screen display is set to receive in hex. Just click on the appropriate "hex display" box. If this is the first time you use the device, you may get the "factory default" values. You can change these if you like using the various options provided in the Windows software. The default IP address is "192.68.0.15". Some people prefer to use numbers ranging from "10.0.0.1", the exact numbers used will not matter as long as each workstation in your domain has a different address. If your PC is part of a larger system, contact your network manager, who will suggest a non conflicting address you can use. You will also need to know the IP address of your PC workstation. This can be found in Control Panel under the Network applet. If your PC is part of a larger network, your IP address may be dynamically allocated, so it may change from session to session. Consult your network manager, who will be able to allocate your workstation with a fixed IP address. The address values are retained in the PICs EEPROM for future reference, so you will only need to enter them once. If you know your PCs allocated IP address, enter it under "remote IP"
Open a MS DOS console on your PC and use the ping and arp commands to check that the PC is talking to the controller and that all is working properly. If there is no response, ensure the controller address matches the requested ping address, also make sure the network card green LED is flashing, which shows that packets are being fired across. The disk files supplied with the chip cover the above instructions in more detail, including examples and lists of commands available. With "877driver.exe" running, enter the two digits "03" in the "set status flag" box, then set the tick next to it, and click on "xmit" to send this command to the PIC. Now watch the PC screen, maybe nothing will happen. If this is so, get your PC to access other workstations on the network, e.g. via Network Neighbourhood in Explorer, or start a network printer. The screen display will suddenly start filling with packet information. You are now watching your network connection and all packets that float past it. The command you have just entered has set the PIC to act in a "receive all packets" mode. Fig 4 shows how the internal flow in the PIC depends on this internal global flag. The data will quickly fill your screen, so press the "clear screen" button every so often. You may notice that even when all the workstations are idle, there will be the odd packet being displayed. Soon you will easily differentiate between ARP, ICMP, DHCP and TCP messages, and with a bit of practice (and help from the literature) deduce where they come from and their purpose. OK, lets do something useful, can it flash lights? On the "set status flag" box, enter the two digits "08", set the tick next to it, and click on "xmit". This sets the PIC to "demo" mode. At this point, we don't need "877driver.exe" any more, so we can close it or put it away, by minimizing it. Now run the program "877demo.exe". This program is a windows version of the listing shown last month. It sends a UDP packet to the PIC via the network, retrieves a response, and then display the results. The GUI front end lets you tick boxes to set any LEDs you want to turn on, and will also display the returning data as digital or analogue values. The program itself is very simple, it operates on the five least significant bits of port C (digital output), and on return, reads port A bit 0 as an analogue voltage, which is displayed as a voltage between 0 and 5 volts. With "877demo.exe" running, ensure the IP addresses shown in the top two windows correspond to that of your PC, and that of the PIC controller. Click "send request", and wait for a response. If nothing happens, check again that all the IP addresses are correct. Do not forget to ensure PIC board is set to "demo" mode as described. Reset the PIC with all the DIL switches in the off position to guarantee this. Once you start getting a response, tick some of the LED selector boxes and click on "send request" again. The LEDs on the PIC board should start turning on or off according to your settings. Try adjusting the trimpot on the PIC board, and watch how the progress bar follows it on the PC screen every time you transmit a request. Full C++ source code is provided to customize this program to your needs. The software was developed in Microsoft Visual C version 6, and it should not be too difficult to port this to other environments such as Borland or Basic. In practice you will only need to deal with one function or subroutine, which is fully documented to make it as easy to understand as possible. The rest of the program is just the standard template functions used by the Visual C environments to provide visual support for Dialog boxes, user buttons and others. How fast can it work? Good you should be asking this, but a more relevant question is "how fast can data be moved across the network?”. I have used the controller to deliver a stream of 8 bit speech from a microphone at 8kbps, and I am sure it could easily run faster than that. The controller itself is purely limited by its ability to read or write the 8019 buffers via its I/O ports. However, there are many other factors to consider as well. In practice, the main limit is the network itself, i.e. how busy it is. There is a major difference in performance whether you want to transmit short bursts of high speed data, or a continuous stream of bytes at a guaranteed rate, as the many devices on the network fight for control. Starting a network printer or running a file transfer between two PCs would cause a noticeable flow disruption in the latter case. It is all a bit like cars joining a busy motorway from a side junction. So no guarantees on data transfer rates, I am afraid. What else can you do with it? The controller provides various levels of functionality. At the lowest level it can deliver raw formatted Ethernet, IP or TCP packets via its serial port. The packets are enclosed in a simple header trailer arrangement, and simple software can be written to decode them. This is useful if you want to build a simple network ‘sniffer’, want to develop your own protocols, or just want to see what's going on in your network. At the highest level, it can provide a point-to-point data stream with all necessary ARP and ICMP support handled internally and transparently. A single flag variable controls the overall data flow. Fig 4. On transmission you just supply the data component of the packet, the PIC will add all checksum and size fields, thus simplifying their generation. A powerful combination is obtained when using the controller with another device, e.g. another PIC. 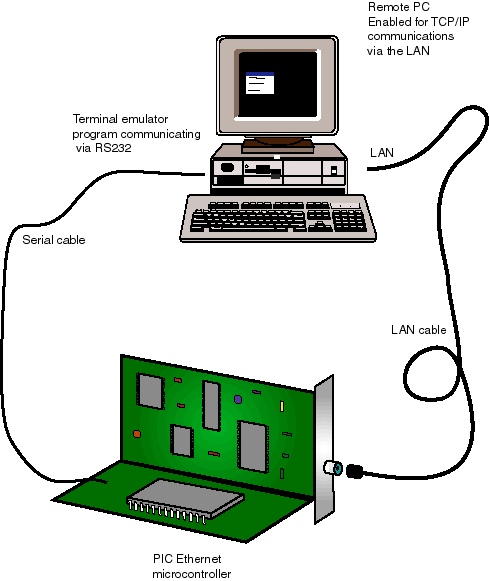 The serial port is an effective method of communicating between the two and for passing both commands and data. In a typical context, a separate PIC is used to accept data signals from the environment, perform the simple conversions, and to control the 16F877 PIC controller using plain byte and text commands. This is a very powerful option as you can develop your own software using your own device; avoiding the complexities of network protocols. The example in Fig 9 (in last month's article) shows how an interface to a home X10 network could be wired up. The 16F84 shown has a simple job, it only needs to convert serial data sent from the PIC controller (at 2400bps in this case) to X-10 type commands. Another example of a two-chip application is shown in Fig 5. This forms the basis of a simple PC network-wide atomic clock reference. The circuit shows a 16F84 used to decode bit data stream signals from a standard Rugby MSF receiver. The ‘84 performs some simple conversion on the time received, and generates a simple pre-formatted UDP data packet containing the clock information which is reformatted as a 32 bit binary word. The exact protocol and format is known as SNTP and is fully described in RFC 1769 and 2030. SNTP is the main method used in Windows 2000 and other networks to align all workstations to an external precision clock. SNTP is enabled in Windows by using the NET TIME command. More information can be found in the http://msdn.microsoft.com technical information website by searching under "SNTP", "Q216734" or "Q224799"
The main limitation is the very small amount of RAM space available within the PIC chip. Input data is streamed, i.e. not stored, so incoming packets can be of any size. However output datagrams are buffered within the chip. This buffer is dynamically allocated to whatever remaining RAM is available at the time, usually between 80 and 200 bytes. This is enough for quite a few applications, but not enough for everything. I tried using the internal RAM buffer of the 8019AS for this purpose, but it appears it cannot be used in full duplex mode, i.e. for doing DMA read and write transfers at the same time. This buffer ceiling places a limitation on any applications that needs to deal with large amounts of data. This means you won't be able to build sophisticated applications such as a web server that require large amounts of data. For this, you'd be better off buying some of the ready made cards and devices with sufficient spare RAM or ROM. The Controller was originally developed as a custom tool for validating security and throughput aspects of routers and firewalls in both IPv4 and IPv6. Recent concerns about overloading systems using low levels SYN attacks, incomplete IP fragments and other difficult to trace methods have made this into a very relevant issue. Please note that using the controller in a shared network can cause real havoc if used irresponsibly. It can be distressing to think that such a small device can be used to bring an apparently secure network to a grinding halt, and without leaving any traces. So if you want to use this in a shared office, lab or a college, please ensure you know what you are doing. Otherwise disconnect the cable to the rest of the network. New Standards?, do we need them? Nowadays, print servers are using TCP and SNMP for their configuration screens. The user just clicks open a standard internet browser to communicate with the print driver, or with the printer itself by means of a standard web page. This has great advantages for the printer manufacturer, he does not need to supply special configuration software programs for the PC, it is all done via web page commands and using a normal web browser. Of course, the Ethernet connected printer or appliance has to act like a fully fledged web server, but as shown in this article, this is not a difficult task, if you know how and have enough computer power. For point to point and time critical applications, some of these protocols are not efficient ways of providing communications. Some concepts such as safety, feedback paths and constant throughput have barely been considered in the present standards which are mainly aimed at user oriented systems. So there is a possibility that new, or variations on existing standards may be developed specifically for certain areas of appliance and embedded device control and communications. Pointers? In a nutshell, IP provides for basic routing facilities, so any new standard will reap their benefits if developed on top of this. Protocols based on UDP are fast and easy to implement, but as UDP contains no inbuilt error management, facilities would have to be provided by the higher layers, which could result in degradation in performance if not done properly. TCP on the other hand, provides a reliable flow, but it requires disproportionate overheads both in terms of extra data and time delays. Many embedded devices may require a reliable connection with quick response, but not necessarily a time consistent circuit, so TCP could easily degrade efficiency. There is plenty of scope for experimentation and coming up of new ideas. Of course, this may not happen at all. The Hayes AT modem command set is still in common use for computer driven applications, complete with its idiosyncrasies and computer unfriendly command set. I hope these articles will have made you a bit more knowledgeable about using the Ethernet in your applications. The main purpose was to bring the concept of network aware devices from a "bottom up" point of view, and help to dispel some of the "black magic" associated with ready made boxed solutions. It should help you in seeing the wood from the trees and also open the possibility of experimenting or developing new network techniques. Not that the world needs any more protocols, but you may have an application where some of the existing methods only makes you think of nuts and sledge hammers. If there is enough interest, we shall publish more articles, perhaps on more specific projects, and using some of the latest devices available. Caption: A cheap PC network card plus micro controller forms the basis for a simple unit that allows a PC access to external I/O devices via a local area network. Caption: Simple C code for the PC showing how to use the Winsock API to communicate with an external I/O device. Refer to the literature for more examples. Caption: The Ethernet chip buffers incoming serial stream and presents the data in parallel form to the micro controller via a circular First in First Out data buffer. The micro performs all necessary high level addressing and decoding. Clean data is then transferred to the user application, which can be embedded in another microprocessor. 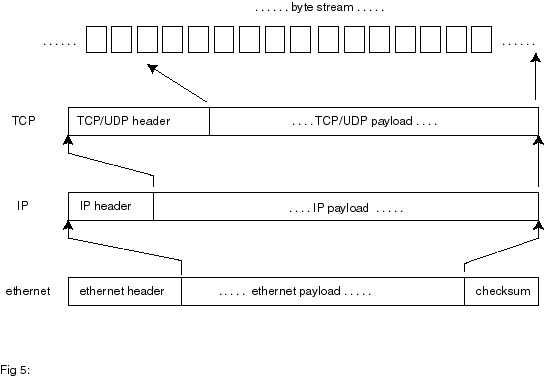 Caption: Ethernet frames comprise of 6-byte destination and source addresses, plus a field word indicating the type of payload carried. The two most common payloads relevant to the TCP/IP world are shown in the figure. The preamble is a string of 62 bits used to synchronise the internal clock generator. A 4-byte CRC word terminates the packet. The Ethernet interface chip strips the headers, performs address comparison and checks for CRC validity before placing the data block in the RAM buffer. Caption: Russian dolls: each protocol packet contains inside another packet of a higher level protocol. Each layer contributes something to the end result: addressing, routing fragmentation, transport, error control and error correction. The end result, in the case of TCP is a continuous, reliable data byte stream. Caption: Commands are available from the DOS prompt that allow you to check your network interfaces. A PC workstation maintains a local cache of other workstation addresses, which is dynamically updated every two minutes or so. Network stations regularly transmit ARP packets to each other to maintain their caches up to date. The DOS command arp is used to display and/or update your local cache. These commands will only work if your machine is network enabled. Caption: Ping sends a probe packet to a remote IP destination, which just echoes the packet back. The sender can use the information collected on the way to deduce aspects of the path, delays, users, route taken etc. The name ping is derived from submarine echo sounders. Ping is a very useful facility for advanced network support. The controller described in this article can be used to generate custom ping type packets. These commands will only work if your machine is network enabled. Caption: Simplified diagram of a TCP conversation. Three stages are essential: setting up the channel, the actual data transfer process, and closing down the conversation. State transition tables are generally used in the software implement the overall process. One set of tables and data memory buffers will be required for every open channel. This is not practical for small microcontroller memory limited applications. Caption: X10 Home Control Interface: a separate PIC forms the basis of a simple interface between X10 home automation and the local area network. No interface standards exist at present for this kind of interactivity. Caption: The circuit diagram for the microcontroller. The ISA socket is a standard 62-pin .1" pitch double sided edge connector as used in most ISA PC motherboards. The trimpot and LEDs are used mainly with the demonstration software. The circuit may draw up to 100mA from the 5volt supply, depending on which ISA card you use. Caption: The Ethernet capuccino maker for the person who has everything: Various sensors for temperature, sound and light intensity can be used to feed back data to the PC on request. Data from the PC can be used to drive digital outputs such as the mains switch, timers etc. Caption: One PC can be used to test and also to drive the controller. The PC uses two Windows programs open at the same time, one driving the controller via the RS232 port, the other via the Ethernet network. 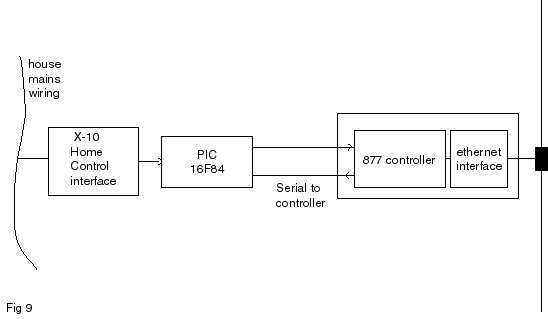 Caption: Internal signal flow path for the controller: The switches correspond to bit flags in an internal register byte, and can be programmed to modify the path of the incoming signal. This seemingly unconventional architecture allows for various pre-processing levels for the incoming and outgoing data blocks. An external processor handling serial character streams is then presented with ‘pre-cooked’ data blocks, ranging from Ethernet raw packets to processed TCP segments. The controller also adds checksum and size entries to outgoing packets to simplify the user software. Using simple external processing power, the device can form the basis for a network analyzer, embedded mail system or simple web server. 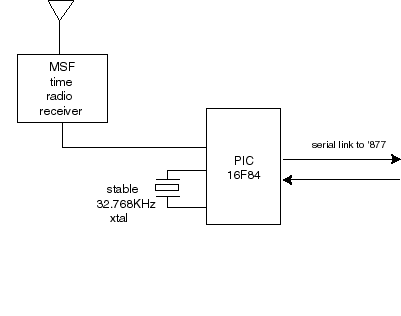 Caption: A practical application: A slave PIC 16F84 receives time signals from the MSF radio receiver which are re-encoded as UDP datagrams and submitted to the controller for sending on to the local area network. The payload conforms to the SNTP protocol on UDP port 123. SNTP or ‘simple network time protocol’ is used in Windows 2000 networks as its main time synchronisation service, and can be used to time lock PC workstations to an external clock reference. More information on SNTP can be found in RFCs 1769 and RFC 2030. 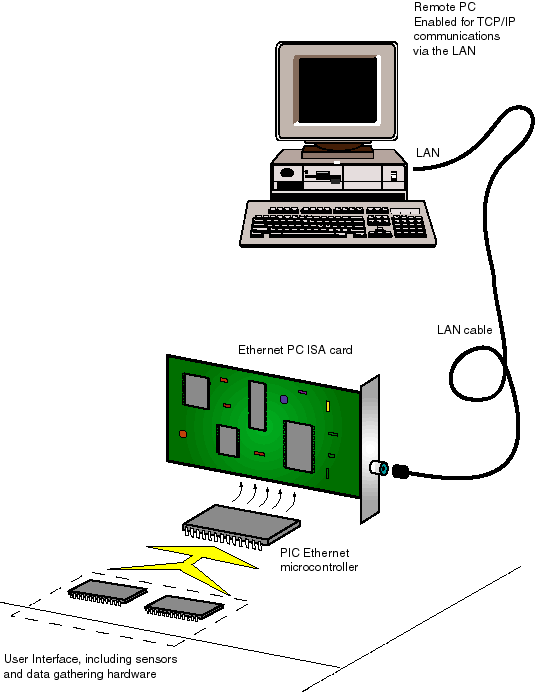 // communicating between a PC and an embedded ethernet device. // and enter the name of the program followed by optional arguments. // this file to the directory. // - Program must be linked with the Winsock 2 library "WS2_32.lib". // usually already present in W95(SP2), W98, NT and W2K. // with simple "goto" type statements. // J. Ohlund, 1999. "Network Programming for Windows", Microsoft Press. // Loads or increments DLL usage count. Must call WSCleanup() on exit! // Winsock will send the UDP datagram to the socket specified in Sdest. // The function also generates a local receive" port number for replies. // message for this demonstration. // for avoiding the call from blocking forever if no data is received. // the reply packet enough time to arrive before next function is called. // Again, no need to include this function in your program. // any bytes left in the receive buffer before calling recvfrom(). // (or until a defined timeout occurrs, if set as above). // If we get this far, data was received OK, do something wiht it!